Mexico City; June 15, 2017.- Viva Aerobus, Mexico's low-cost airline, today adds a new Airbus A320ceo aircraft. 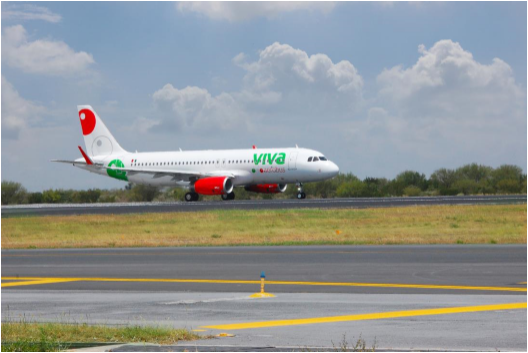 With its arrival, the fleet of Viva Aerobus, which stands out as one of the youngest in Mexico and in the region, already has a total of 22 Airbus A320 aircraft, two of them A320neo. This new aircraft delivery is part of the fleet renewal strategy initiated by Viva Aerobus in 2013, when it announced the purchase of 52 Airbus A320 aircraft, until then the largest order in Latin America with an investment over 5 billion dollars. This new aircraft is incremental, so the order is now of 53 aircraft. Viva concluded its fleet renewal in October 2016 and today operates a 100% Airbus A320 fleet. This modernization and a fleet integrated by a single type of aircraft, boosts the ultra low-cost business model of Viva Aerobus by allowing the simplification of processes, a higher use of resources and a greater efficiency in order to continue offering the most competitive prices of the market, keeping the highest standards in security, comfort and quality thanks to the advanced Airbus technology. This new aircraft has the capacity to transport 186 passengers and thanks to the widest single aisle cabin on the market and more spacious seats (18 inches) equipped with cushions of greater comfort, offers a greater comfort to passengers during their flights. In addition, the A320 family has the lowest operating costs and the most efficient fuel consumption on the market. "We are very proud to receive this new aircraft, as it reflects our commitment to renew the fleet. Besides, it is also an effort that strengthens the pillars of our business model. With our fleet, we are not only more efficient, we also improve the travel experience of our passengers at the best price, a key element of our customer focus”, said Juan Carlos Zuazua, general director of Viva Aerobus. Viva Aerobus is the fastest growing airline in Mexico and the arrival of this new aircraft will increase its operating capacity. Viva Aerobus has been operating for three consecutive months with a 90% load factor and with a 39% increase in passenger traffic during May compared to this month of the previous year. Viva Aerobus Viva Aerobus is Mexico's low-cost airline. It started operations in 2006 and today operates the youngest Latin American fleet with 22 Airbus A320, including two Airbus A320neo on 75 routes and 33 different destinations. With a clear vision to give all people the opportunity to fly, Viva Aerobus has democratized the airline industry with the lowest rates in México and the lowest costs in Latin America, making their flights the best value offer.